An inventor from Novi uses light to eliminate production errors. Paul Ryznar, a former vice-president at Detroit Diesel, is well aware that overcoming human error for workers on a factory floor is a common challenge for manufacturers. Rather than set up an expensive post-production inspection system to prevent bad parts from reaching customers, Ryznar, who grew up on a small farm in Belleville, worked evenings and weekends in his basement to develop a projector-based software technology platform that guides workers and confirms the completion of assembly processes. 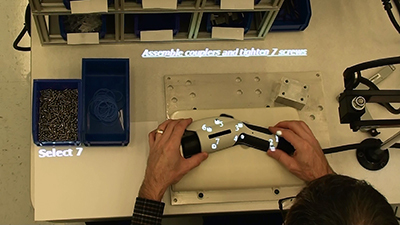 “I developed a digital operating canvas guide where we use overhead light from a projector to guide workers through the assembly process,” says Ryznar, the creator of what he calls Light Guide Systems, and president and CEO of OPS Solutions in Novi. Founded in 2005, the company’s customer base includes dozens of factories operated by General Motors, Chrysler, and Case New Holland (CNH Industrial N.V.), among others. According to a 2014 case study by Chrysler, assembly errors were reduced by 38 percent using Light Guide Systems over standard work instructions, while productivity (output) increased by 82 percent. In addition to automotive, the technology is used in an array of industries including aerospace, agriculture, energy, heavy equipment, and medical devices.